Tom Hanks (Captain Phillips) stars in the classic fish-out-of-water tale A Hologram for the King. 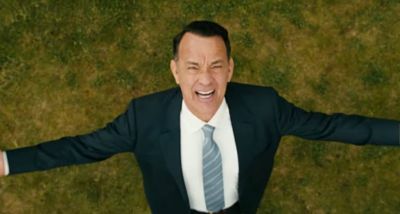 Hanks portrays Alan Clay, a recently divorced American businessman who is sent overseas to pitch a state-of-the-art holographic teleconferencing system to a king. As Alan vainly tries to navigate new and unusual customs, he finds himself thrust into a series of wonderful misadventures, and a fateful encounter that changes his life forever. Based on The New York Times best-selling novel of the same name by David Eggers, the comedy-drama was directed by German filmmaker Tom Tykwer (Run Lola Run), who last worked with Hanks on the ambitious 2013 film Cloud Atlas. The film also features Sarita Choudhury (TV’s Homeland), Ben Whishaw (Spectre) and Tom Skerritt (Top Gun) in the cast. The film received above average notice from critics but didn’t make much noise with audiences, ultimately grossing $4.1 million at the domestic box office during its limited release earlier this year. The home entertainment release features three behind-the-scenes featurettes.